The U.S. Mint has announced this year’s uncirculated mint sets will be available Monday, July 30, for the price of $22.95. 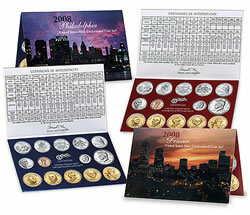 The 2008 United States Mint Uncirculated Coin Set® includes two folders of 14 coins each. One folder contains coins minted in Philadelphia with the "P" mint mark and other folder has coins from Denver bearing the "D" mint mark. As of last week, U.S. Mint provided figures show that 894,443 of the 2007 uncirculated sets have been sold. These will be available for purchase through the Mint until noon on July 30. The price for the 2008 mint set is identical to last year’s set, and includes a total face value of $13.82 in change. More specifically, the sets include the following coins. The Mint indicates a shipping and handling charge of $4.95 will be added for all domestic orders. I bought the 2008 us mint uncirculated set and the John Adams 1 dollar coin is missing..My question is..was it there mistake.should I send it back,or is it worth anything….